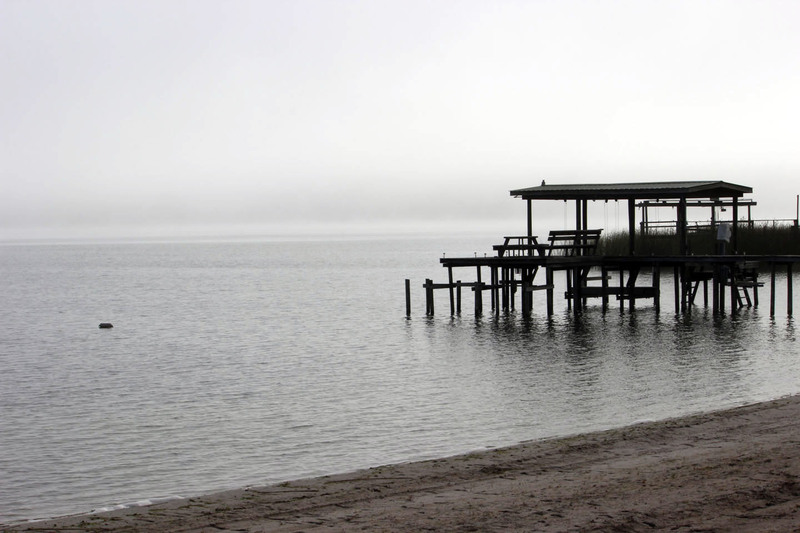 Amrit Yoga Institute, Salt Springs, FL: This morning as I left my room to get a cup of tea I cast a passing glance at the beautiful lake behind me. I have so many pictures of sunrises and sunsets on this lake that I have actually become complacent about them. I noticed there was a nice mist. Seen it before. As I passed by a holly bush I was startled by a beautiful huge butterfly moth that bumped my shoulder. As I watched the moth fly past me – she was intent on turning me around – her path led me right back to the lake. The mist was shifting, becoming more dense. Things were getting interesting. Not one to shirk a sign – especially from a butterfly moth! – I headed to the shoreline. It was peaceful and beautiful, etheric. The many shades of white and gray; the mist blending its surroundings together, no demarcation between the sky and the lake. While the sky produces magnificent colors during its opening and closing acts each day, a misty, gray morning once in a while provides a nice place to rest the eyes, a blank slate for the mind. It’s the color of breath. Grateful to my moth friend, I sat for a few moments appreciating the beauty of a world even without color.